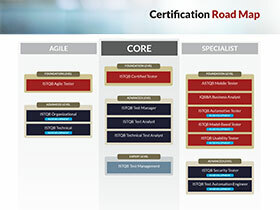 The CompTIA IT Certification Roadmap can make navigating the world of certifications a little easier. 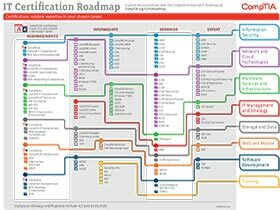 Download the CompTIA Certification poster (PDF) or explore the possibilities with the CompTIA Interactive IT Roadmap at: CompTIA.org/CertsRoadmap. 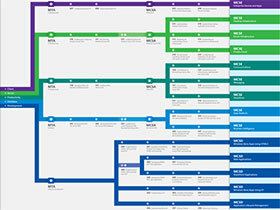 The Microsoft Certification Roadmap (PDF) will help you understand the new certification paths. To find out more about Microsoft certifications and training options you can also visit Microsoft Learning. Download the Cisco Career Certification and choose a career path that meets your goals for professional and financial rewards. 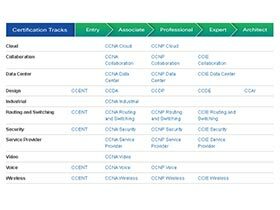 For more detailed information you can also visit the interactive Cisco Certification Job Matrix. ISTQB® (International Software Testing Qualifications Board) has created the world’s most successful scheme for certifying software testers. As of December 2015, ISTQB® has administered over 600.000 exams and issued more than 440,000 certifications in over 100 countries. The Oracle Certification Program certifies candidates on skills and knowledge related to Oracle products and technologies, such as Java, Oracle Database, MySQL, Solaris, Linux, Oracle Cloud, and Applications. 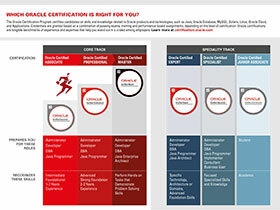 Oracle certifications help you stand out in a crowd among employers. You feel that your skills and knowledge are not enough to take you to your goal? We can help you overcome the gap and pass your next exam. Pass IT is a daughter company of New Horizons Bulgaria – a reputable IT and business training company, operating for over 13 years on the Bulgarian market and over 33 years worldwide. New Horizons Bulgaria is an authorized partner of leading global companies in the field of information technologies, amidst Microsoft, EC-Council, IBM, CompTIA and others. The company offers a full selection of courses and training to help you earn today’s top IT industry certifications from vendors and associations such as Microsoft, Citrix, CompTIA, Cisco, EC-Council, IBM, Linux, VMware, PMI and others. Explore training opportunities at https://www.newhorizons.bg оr contact New Horizons Bulgaria at +359 2 4210040, email: office@newhorizons.bg.